It was a busy spring at Faith in Madison, AL. We finished our winter drive of “Hats for the Homeless” in which the ladies crocheted and knitted 100 hats that were dispersed through a local charity. We also did an out reach for the Mission, which was in dire need of baby supplies for the Mother and Child Unit. Of course, the central activity of the season was Easter, and our annual Easter egg hunt on Palm Sunday was a rousing success. 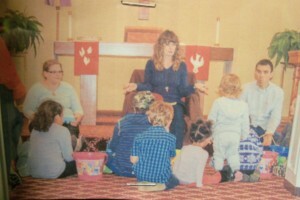 Blessed with good weather, we started with the telling of the Easter story in the sanctuary and then the kids hunted eggs, ate snacks, played games and did many craft activities. A special thanks to Jen Doerk for coordinating this year!